To Cite: Moein M, Aghajani M, Mirbagher Ajorpaz N, Khorasanifar L. Effect of an Empowerment Program on Self-Efficacy of Patients With Type 2 Diabetes, Iran Red Crescent Med J. 2017 ; 19(1):e29252. doi: 10.5812/ircmj.29252. Background: Type 2 diabetes is a chronic disease that is spreading very quickly worldwide and is second in priority for investigation of chronic diseases. According to research, self-efficacy is low in diabetic patients. Objectives: This study analyzes the effect of empowerment programs on self-efficacy in type 2 diabetes patients. 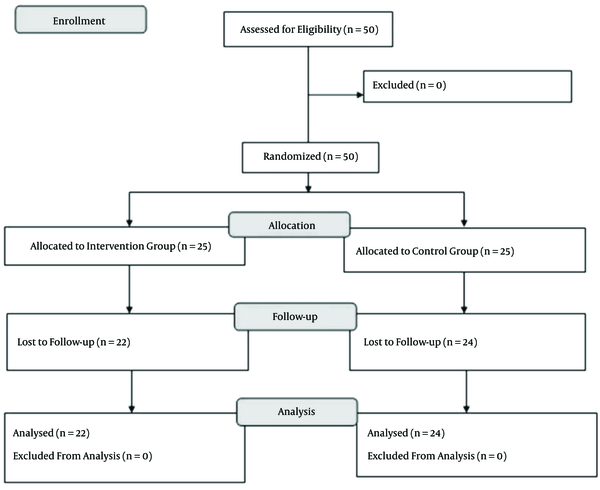 Patients and Methods: In this clinical trial, 100 patients with type 2 diabetes who had inclusion criteria were chosen randomly and divided into control and experimental groups by a randomized block method. Intervention was accomplished through educational sessions scheduled twice a week for four weeks. Diabetes self-efficacy questionnaires were completed before and two months after the intervention for each group. Data were analyzed using the SPSS 16 and the Mann Whitney U, chi-square, exact Fisher’s, and t-test statistical tests. Results: Before intervention, the mean score of self-efficacy was 45 ± 14.49 and 39.61 ± 17.01 for the experimental and control groups, respectively, and the difference was not significant (P = 0.1). Two months after the intervention, the mean of self-efficacy was 55.71 ± 13.25 and 40.24 ± 17.55 for experimental and control groups, respectively; and the difference was significant (P < 0.001). Conclusions: Using an empowerment program had positive effects on self-efficacy in patients with type 2 diabetes. Diabetes mellitus is a metabolic disorder resulting from defects in insulin secretion, insulin action, or both. It is classified into two major types, type one and type two diabetes (1). Type 2 diabetes is a chronic disease with an alarming rate of expansion throughout the world. Genetic and family history, environmental factors, lack of exercise, and inappropriate diet may all play roles in insulin resistance and/or dysfunctions in beta cells (2). Evidence shows that only a small part of chronic disorders such as diabetes are being managed by health care professionals while the majority of patients or their families are managing the disorders by themselves. Therefore, it is important to improve the patients’ self-management behaviors (3). Empowerment programs play important roles in changing diabetic patients’ self-management behaviors (4). Such programs would affect the patients’ behaviors not only through education but also by improving their perception of their disease and increasing their motivation toward self-care. Then, self-management gradually would substitute for the absolute obedience to the physicians’ orders (5). Most empowerment programs are based on behavior-change models. Self-efficacy is not only one of the most important factors in behavior-change programs (3) but also an important internal factor for long-term control of chronic diseases (6). Education and empowerment programs provide the basis for achieving optimal glycemic control and avoiding diabetes complications through increasing the patient’s knowledge of the treatment methods and also by teaching them some effective behavioral and self-management techniques (7, 8). However, some studies have shown that the level of self-efficacy in diabetic patients is low and there is a need to promote patients’ self-efficacy in self-care (9, 10). Steuten et al. (11) showed that a program for diabetes management not only can increase patients’ self-efficacy but also can improve their quality of life. A systematic review on the clinical effects of empowerment programs in type 2 diabetes patients has recently found that patient empowerment projects could significantly promote holistic diabetes management (12). In contrast, Kamimura et al. (13), in a study of the effect of education on knowledge, attitudes, self-care, and lifestyle in patients with type 2 diabetes, have reached the conclusion that empowerment programs have little effect on self-efficacy in diabetic patients. Tol et al. have also studied empowerment and its influential factors among patients with type 2 diabetes and reported that, with an increase in age and duration of the disease, diabetic patients show less readiness to change their behaviors. Therefore, empowerment programs that seek to change behavior would not be successful in these patients (14). Cinar and Schou (15) also have investigated the issue of self-efficacy in patients with type 2 diabetes and reported that traditional methods of patient education are more effective than the modern empowerment methods in enhancing the patients’ self-efficacy. In a study of the effects of two education methods on glycemic control and blood pressure in patients with type 2 diabetes, Molsted et al. (16) reached the conclusion that empowerment programs have little effect on glycemic control and blood pressure. Due to the increasing prevalence of diabetic patients in Iran and around the world, the profound effects of this disorder on the self-efficacy of patients, and the lack of use of Anderson’s empowerment model in diabetic patients in Iran, we conducted this study to investigate the effect of a self-empowerment program on self-efficacy in patients with type 2 diabetic. The present study investigates the effect of a self-empowerment program on self-efficacy in patients with type 2 diabetic. This study was a clinical trial conducted on patients with type 2 diabetes who had files in the diabetes center of Kashan city in Iran in 2014. The center is a public outpatient clinic for the prevention and treatment of diabetes. The sample size was calculated based on a previous study (17). The sample of 60 subjects was estimated to be needed in each group based on the following parameters: β = 0.20, α = 0.05, power = 0.80 and standard deviation = 10. Sampling was performed sequentially and then the patients were allocated to the experimental and control groups according to a randomized block method. According to the formula, the sample size in each group was 30 subjects. Inclusion criteria were an age range of 30 - 65 years old, having a medical diagnosis of diabetes for at least one year, being physically and mentally able to participate in the study training sessions, being literate, and willing to participate in the study. Exclusion criteria were occurrence of any acute and chronic complications during the study and absence from more than two of the training sessions. Three patients in the intervention group were excluded due to absence from more than two sessions. Also, one patient was excluded from the control group due to incomplete response to the study instrument (Figure 1). A two-part questionnaire was used in this study. The first part consisted of questions on the patients’ demographic information, including age, gender, marital status, number of children, education level, occupation, duration of disease, type of treatment, and other ailments. The second part included the Lorig questionnaire for measuring the self-efficacy of diabetic patients. This questionnaire was developed by Lorig at Stanford University, and Cronbach’s alpha of 0.82 has been reported. The Lorig questionnaire consists of eight items. Each item is scored on a scale of 1 (I am not sure) to 10 (I am pretty sure), with a total score from 8 to 80. The higher the score, the higher the level of self-efficacy. The Lorig questionnaire was used in Iran before, and its reliability and validity have been approved (Cronbach’s alpha 0.77 - 0.89) (18). The Lorig questionnaire was given to five patients, and five diabetologist confirmed the content validity of the instrument. Before the intervention, the research objectives were explained to the participants, and written informed consent was obtained. In addition to their routine treatments, patients in the experimental group participated in the empowerment program, which was adopted from Anderson’s empowerment model (19). This program consists of five steps (Table 1) and was conducted in eight 45-minute sessions that were held at Kashan’s diabetes center two days a week for four consecutive weeks (14, 15) . The control group received only their routine services at the diabetes center. All participants completed the demographic data forms and the questionnaire of “Self-Efficacy for Diabetes” at the beginning of the study. Two months after the last session, all the patients answered the self-efficacy questionnaire again. Research showed that the effects of the empowerment program on diabetic patients should be measured two months after the last session (14, 15). Fifth Explaining and exhibiting some practical procedures commonly needed by diabetic patients (using glucometer for measuring blood glucose level; where to store insulin; how to use insulin syringes; how to do insulin injections, etc.). Inducing group discussions on problems and the best practice in such procedures. Eighth Overcoming the patients’ weak points. Encouraging a healthy lifestyle in coping with diabetes. Summarizing and reviewing content of the previous sessions. Scheduling the evaluation session after two months. Giving patients a phone number for receiving more advice if needed. Data were analyzed using the SPSS software version 13. Descriptive statistics (frequency, percentage, mean, and standard deviation) were calculated for demographic variables. The Kolmogorov-Smirnov test was used to assess the normal distribution of variables. Nominal and categorical demographics of the two groups were compared using the chi-square and Fisher’s exact tests while quantitative demographic variables were compared using the Mann-Whitney U test. The mean self-efficacy scores of the two groups were compared using an independent sample t-test while a paired t-test was used for within-group comparisons. Ethical issues of the study were approved by the research ethics committee at Kashan University of Medical Sciences. The research objectives were explained to all participants. All participants signed a written informed consent and were assured about the voluntary nature of the study and the confidentiality of their personal information. This study has been registered at the Iranian registry for clinical trials with the registry number of 2014070818400. Most of the participants in the two groups were women (70.2% in the intervention group vs. 61.2% in the control group) and married (91.5% in the experimental group vs. 93.9% in the control group). No significant differences were found between the two groups in terms of variables such as age, gender, marital status, education level, job, and type of medical managements (P > 0.05) (Table 2). Before the intervention, no significant difference was observed between the mean self-efficacy scores in the two groups (45.00 ± 14.46 in the intervention group vs. 39.61 ± 17.01 in the control group, P = 0.1). While the mean self-efficacy score of the control group remained relatively unchanged at the end of the study, this score significantly increased in the intervention group. Therefore, at the end of the study, a significant difference was observed between the mean self-efficacy scores in the two groups (55.71 ± 13.25 in the intervention group vs. 40.24 ± 17.55 in the control group, P = 0.001) (Table 3). In the present study, the mean self-efficacy score of the experimental group significantly increased at post-test, while the mean self-efficacy score did not significantly change in either comparison with pretest or in comparison with the intervention group. These findings were consistent with the results of Zamanzade et al. (20), who studied the effect of an empowerment program on the psychosocial aspects of self-management in diabetic patients. The difference in this study and that of Zamanzade et al. is the type of empowerment program. This study used Anderson’s empowerment program. Coulter et al. (21) have shown that using empowerment programs in chronic patients can increase their physical and mental health. Nishita et al. (22) also have studied the effects of an empowerment program on self-efficacy of patients with type 2 diabetes. They reported that the implemented program not only could enhance the patients’ self-efficacy but also improved the diabetes control. Evidence shows that a reciprocal relationship exists between empowerment and self-efficacy (23). Moreover, studies confirm that culturally based empowerment programs not only may help diabetic patients decrease their levels of HbA1C, blood pressure and cholesterol (24) but also can improve all aspects of patients’ self-efficacy, self-care behaviors, and attitudes toward their diabetes (4, 19, 25). In a qualitative study of diabetes self-management strategies, Frost et al. reported self-management and supportive programs bring changes in patients’ health care behaviors that consequently would lead them to a better adherence to treatment and exercise regimens (26). Moreover, in a study of 360 high school teachers, Asghari et al. (27) have shown that empowerment programs also could increase the levels of job satisfaction and self-efficacy in healthy people. In contrast, in a study of the effect of an empowerment program on self-management in diabetic patients, Sturt et al. (28) reported that intervention did not significantly affect patients’ self-efficacy. The latter study suggests that the empowerment programs might not be effective in all chronic conditions. The weaknesses of this study include the following: 1. the research was carried out in a medical center; 2. there was a shortage of educational supplies in the Kashan diabetes center; and 3. the self-efficacy questionnaire was completed only once after intervention. The strong points of this study were that 1. This study was a clinical research trial; 2. random sampling was used; and 3. Anderson’s empowerment program was used. In conclusion, the results of the present study, along with the findings of previous investigations, revealed that empowerment programs are effective in enhancing the self-efficacy in self-care of patients with diabetes. The observed positive effects may not only be attributed to the nature of the intervention but also to the diabetic patients’ aspiration to be autonomous and independent in daily living activities and care needs. Given the positive effects of the empowerment program on self-care of patients with diabetes, the same programs are suggested to be integrated in the routine health care and education of patients with diabetes. In this study we implemented the empowerment program in a large group. We also re-assessed our participants after two months. Therefore, the long-term effects of the intervention could not be assessed. Perhaps small-group training or individual education might be more effective; therefore, duplication of the same program in small groups or an individual basis is suggested. Also duplication of the same study with a longer follow-up is suggested. The research group would like to thank the Research Department of Kashan University of Medical Sciences for financial support of the project. Authors’ Contribution: Neda Mirbagher Ajorpaz and Mohammad Aghajani participated in design, statistical analysis, and drafting of the manuscript. Maryam Moein participated in design and collected data. Leila Khorasanifar helped collect data. Neda Mirbagher Ajorpaz supervised the study. All authors read and approved the final manuscript. Funding/Support: This project was supported by Kashan University of Medical Sciences.